Can Sony compete with Apple's best? Sony’s second main flagship of 2018 - the Sony Xperia XZ3 - has arrived, but it has got some steep competition, including from the iPhone X, which – despite launching back in 2017 – is still Apple’s latest handset and still a top seller. With its QHD+ OLED screen, stereo speakers, high-end power and more the new Sony flagship has a lot going for it but, of course, so does the iPhone X, and while they’re both high-end phones there are a number of key differences. If you’re not sure which to choose you should definitely wait for our full review of the Sony Xperia XZ3, but ahead of that we’ve compared the specs of the two phones, so you can see what strengths each has on paper. The Sony Xperia XZ3 and the iPhone X both have a metal frame and a glass back, but the rear of the Sony Xperia XZ3 is much curvier and the phone is thicker at 9.9mm, to the iPhone X’s 7.7mm. They also look quite different. There’s an Apple logo in the center of the iPhone X’s rear, while you’ll find an annoyingly-placed fingerprint scanner there on the Xperia XZ3 (the iPhone X doesn’t have a fingerprint scanner, relying instead on face detection with Face ID). The cameras are also laid out differently, with two of them towards the left edge of the iPhone X and just one in the center of the Sony Xperia XZ3. Even bigger differences come when viewing the phones from the front. We’ll cover the screen itself below, but note that the iPhone X has a notch at the top and basically no bezel below the screen, while the Xperia XZ3 has a full-length bezel both above and below its display. One area where the XZ3 has the edge though is in water resistance, as its IP68 rating means it’s slightly more waterproof than the IP67-rated iPhone X. The two phones also come in a different selection of colors. For the iPhone X you can choose from Space Grey or Silver, while the Sony Xperia XZ3 comes in White Silver, Forest Green, Black or Bordeaux Red. Of course, their weights and dimensions also differ. The Sony Xperia XZ3 is 158 x 73 x 9.9mm and 193g, while the iPhone X is 143.6 x 70.9 x 7.7mm and 174g. So the iPhone X is smaller in all dimensions as well as being lighter. Sony and Apple both switched to OLED screens for these phones, so both should be quite vibrant with good contrast – the iPhone X certainly is but we’ll give you our final verdict on the Xperia XZ3’s screen when we’ve fully reviewed it. The Sony Xperia XZ3 has a 6-inch QHD+ display though while the iPhone X has a 5.8-inch 1125 x 2436 one, so the XZ3’s is a bit bigger and sharper. The Xperia XZ3’s screen is also curved, while the iPhone X’s is flat, but where the iPhone X has just a notch, the Sony Xperia XZ3 has quite large bezels. The aspect ratios also differ a bit, with the Sony Xperia XZ3 being 18:9, while the iPhone X is 19.5:9. However, both phones can playback videos in HDR, so both are banking on the next-gen display tech being important to consumers. Which screen is better could well be subjective but keep an eye out for our full Xperia XZ3 review to get a better idea. 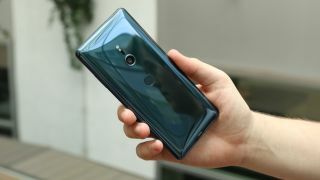 The Sony Xperia XZ3 runs Android 9 Pie, which is the brand-new version of Android currently found on very few phones. The iPhone X meanwhile runs iOS 11. As ever when comparing Android and Apple phones the difference in operating system is one of the biggest differences – you probably already know which you prefer. As for power, the Sony Xperia XZ3 has a Snapdragon 845 chipset and 4GB of RAM. The former being a top-end chipset and the latter being more or less competitive with other flagship phones (though a few have 6GB or even 8GB of RAM). The iPhone X on the other hand has a similarly top-end Apple A11 Bionic chipset and 3GB of RAM. As ever with Apple phones the specs don’t tell the whole story, so don’t be put off by the lesser RAM amount – this thing is at or near the top of most benchmarks and silky smooth in use. For storage you get 64GB plus a microSD card slot in the Xperia XZ3, while the iPhone X comes with either 64 or 256GB but doesn’t have a microSD card slot, so there’s no expansion potential. You get a 19MP single-lens f/2.0 camera on the back of the Sony Xperia XZ3, one with the ability to shoot 4K HDR videos or Full HD slow motion 960fps videos. The iPhone X meanwhile has a 12MP dual-lens camera, with one f/1.8 aperture lens and one f/2.4 aperture. We haven’t properly tested the Xperia XZ3’s snapper yet, but we can tell you that the iPhone X’s is impressive and even works quite well in low light. It can also record video in 4K at 60fps (though not with HDR). Round the front you get a 13MP f/1.9 camera on the Sony Xperia XZ3, while the iPhone X has a 7MP f/2.2 one, but that doesn’t tell the whole story as it’s a TrueDepth camera, capable of judging depth to effectively blur parts of the image for an impressive bokeh effect. Neither phone has a particularly large battery. The Sony Xperia XZ3 has a 3,330mAh one and the iPhone X has an even smaller 2,716mAh one. In our review we found that the iPhone X offered a solid day of life – we’ll let you know how the XZ3 fares once we’ve properly tested its battery. However, both phones support wireless charging. The Sony Xperia XZ3 will start hitting stores from the end of September in some regions, but the UK will have to wait until October 5. However, you can at least pre-order it now. We don’t know if or when the Xperia XZ3 will land in the US or Australia, or how much it will cost there, but in the UK it costs £699 (around $910/AU$1,250). The iPhone X on the other hand is available now in all those regions, but it costs a lot, starting at $999 / £999 / AU$1,579 for the 64GB version and rising to $1,149 / £1,149 / AU$1,829 if you want 256GB. We won’t know exactly how the Sony Xperia XZ3 compares to the iPhone X until we’ve put it through a full review, but going purely on specs it has a larger, higher resolution screen and a similar amount of power, but a chunkier build and one less camera. There are other differences too, highlighted above, with the most notable of course being the operating system, along with the price, as the Sony Xperia XZ3 is significantly cheaper, despite being newer.